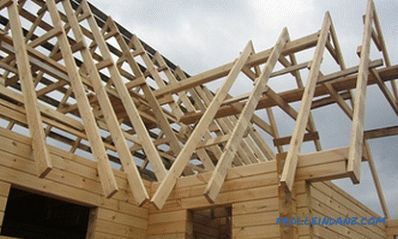 When building a country house or cottage yourself, a roof is usually erected with 2 slopes. It may be symmetrical or not. It is the easiest way to construct such a construction independently, without the involvement of specialists and serious financial investments. But at the same time, you will need to calculate the roof system for the dual-pitch roof. 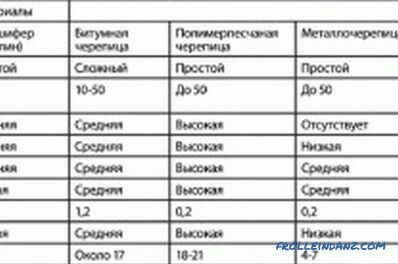 Implementation of this work can be ordered in the project organization. But, as a rule, such services are not cheap. Therefore, it is easier to calculate the parameters of all the elements yourself, given the nuances of the construction being constructed. To calculate the exact design of the truss system, you must first determine the total area of ​​the dual-slope roof. It can be carried out independently, without resorting to the services of specialists. But if you plan to build a non-standard roof, in which there are mansard rooms or a complex form of slopes (multi-level roofing), then it is wiser to turn to professionals. 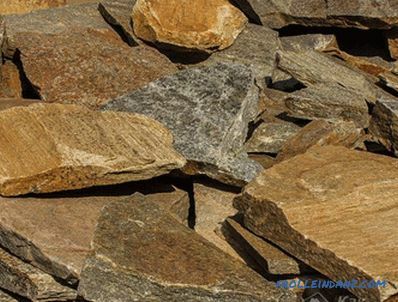 the type of materials that will be used for the construction of the roof. The dimensions of the timber must be included in the calculation of the total area of ​​the roof, otherwise you will get incorrect results. When determining the length of the slope, the distance between the lower edge of the ridge and the extreme point of the eaves is taken into account. Establishing the dimensions of volumetric elements, it is not necessary to measure the dimensions of the ventilation shafts, skylights and chimneys. After the dimensions of the roof slopes are set, it is necessary to determine the parameters of the slopes. To do this, the slopes are multiplied by the cosine of the angle at which the slope of the roof will be formed. It should be noted that the miscalculation is carried out only in relation to the overhangs. It is easiest to calculate each element separately. And only at the end add up all the numbers received. If you plan to cover the roof with rolled materials or tiles, the length of the slopes will decrease by about 60-70 cm. 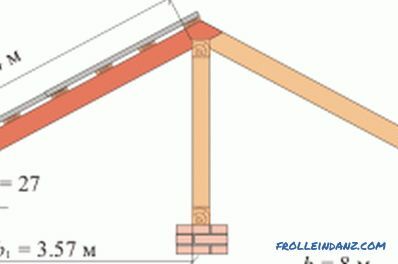 After the total area of ​​the roof has been determined, it is necessary to calculate the main elements of the frame. 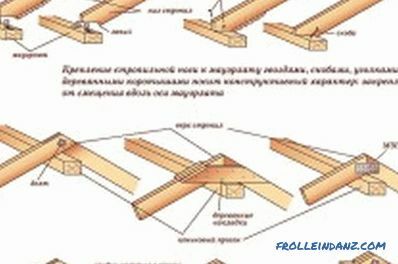 It is much easier to buy a ready-made set of rafters, which are offered by many Russian and Western firms. Then there will be no need to manufacture individual elements. In addition, a pre-equipped system is easier to install, which saves time when building a house. But usually these kits are much more expensive than self-made rafters. Width between supports. The distance is measured between the supports of the roof slope. This takes into account only a large measure (the maximum distance between the calculated points). Distance between axes (this parameter is also called the spacing of beams). The angle of the rafters in the construction of a particular slope. Load on the roof and its bearing supports. This parameter is calculated as the sum of constant and variable components. It is more reasonable to provide the last calculation to specialists from a design organization or a company selling you a set of rafters, since with such a design it is necessary to take into account many specific parameters. For example, the force of the winds blowing in the construction area, or the annual amount of precipitation. Whatever type of dual-ply roof you choose, the construction will be based on a triangle. Since it is he who is the most stable and rigid geometric figure. Based on this, it is necessary to begin the calculation of the whole structure. 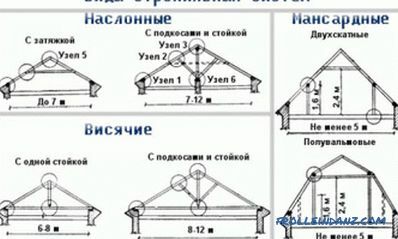 Scheme of attachment points of the truss system. The section of the bar used to make rafters may vary. The thinnest material has parameters 4 * 15 cm, and the thickest one can have sides of 10 * 25 cm in size. The section you need depends on the distance between the axes of the system, that is, the beam spacing. In addition, it is necessary to take into account the length of the supports themselves. Experienced designers when calculating take into account wind and snow loads on the rafters. 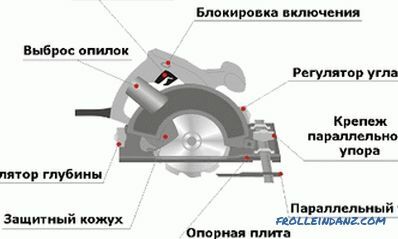 The general principles of the selection of the beam section are shown in fig. 1. Further design calculation depends on the type of rafter system node you choose. an increase in the area of ​​support with the help of additional bars (prism formation). When choosing a structure, it should be borne in mind that if the length of the beams exceeds 5.5–6 m, then all additional inserts must be made on supports. This will help relieve the rafter load. In addition, you must also use additional block beams. They are needed to provide the necessary rigidity of the system. If you do not provide such anchorage, then over time the rafters will "lead." That is, they will be located not vertically, but at an angle. 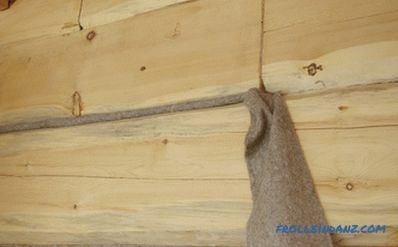 strapping bar, which will serve as a mauerlat (support). 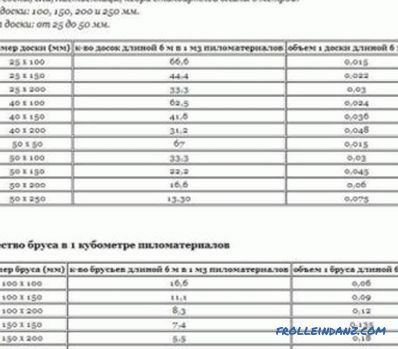 Table of characteristics of roofing materials. for braces, fillings, puffs and eaves boxes - 5 * 15 cm. As mentioned above, the dimensions of the material must be taken into account when calculating the total area of ​​the roof. The dual-pitch roof is usually an isosceles triangle. Therefore, it is not at all difficult to calculate the required amount of materials and the size of individual elements that will be needed for its construction. It is easiest to hold it, having a clear example in front of your eyes. distance between the rafters - 1.2 m.
CB = 0.5 * Fr / tgY / 2 = 0.5 * 3.5 / 1.73 = 1 m.
By = Dl * Dsn = 6.5 * 2.3 * 2 = 29.9 m 2 . 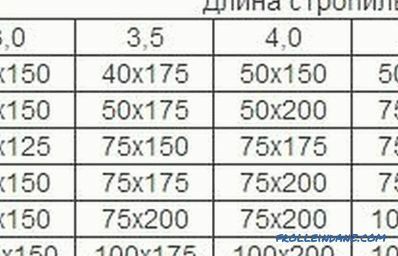 This parameter is necessary not only for the calculation of the truss system, but also to determine the required amount of material to cover the roof. 2 * (DSn + Shr + CB) = 48.3 running. m.
This is exactly the amount of material you will need for self-erecting a roof frame.